Lights, camera, action! Take your company’s story to new heights with video. It’s the king of content in the marketing world, so if you’re not using this highly visual tool to engage with existing and potential customers, you’re missing out. Don’t believe us? Consider that YouTube is the second biggest search engine in the world after Google – with more than a billion users and around four billion video views per day! At Curve, we understand that video production can be intimidating. That’s why we shoot and edit videos for our clients. Our unique team includes former journalists and television producers, videographers, and marketing experts who know how to craft visual stories that help businesses stand out from the competition. Not all videos are created equal. When it comes to incorporating videos into marketing efforts, quality is much more important than quantity. 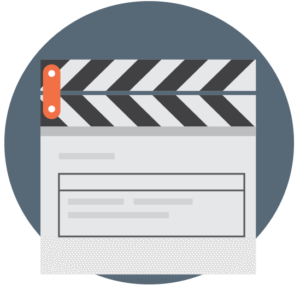 A single, polished corporate video can be posted on a company’s website, shared on social media, and broken down and used in digital advertising efforts. Great video will even help to improve search engine optimization. We understand that dumping countless poorly-shot, amateur videos on your website is not the answer. Video for the sake of video is never a good idea. In fact, that strategy can backfire and easily tarnish a company’s brand. Our video production service involves getting to know you and the products or services you want to promote, the feeling and emotions you wish to convey, the purpose of the video and much more before we ever get behind a camera. More companies are starting to take advantage of live video streaming platforms like Facebook Live, Periscope and even Snapchat to promote their brands. When it comes to connecting with your target audience, live video is extremely effective. And it doesn’t require knowledge of shooting or editing video. In fact, all you need is your smart phone and a strategy. Curve can suggest ideas for live videos and help promote them through social media and other channels. For example, maybe you’re a restaurant owner or celebrity chef and you want to give viewers a cooking lesson or you’re speaking at a prestigious event, but want all your fans to be able to listen. We bring ideas to the table and the marketing know-how to make your next live video a huge success. Our videos are creative, captivating and effective. From corporate and crowdfunding videos to whiteboard, social media and live videos, we do it all. Set your next campaign in motion with Curve in the director’s chair.